The Fantastic Arcade festival offers prizes and big-screen glory to the team that can create the best short film in 48 hours, using only a 3D game engine. The Fantastic Arcade, an independent games festival being held later this year, has advertised itself as "where video games and film festivals collide." It seems that they meant that literally, as the festival has declared that it will be holding a machinima - animated filmes created using a 3D game engine - competition this September. Over the course of forty-eight hours, teams will compete for prizes and the chance to premiere their machinima at the actual game festival. Beginning at 7:00 PM, central time, on September 10th, production teams will have exactly two days to design, animate, and edit a short film (under four minutes) using whatever 3D game engine is at their disposal. The only rule is that all contestants include a particular line of dialogue and follow the genre given to them by the Fantastic Arcade judging panel. 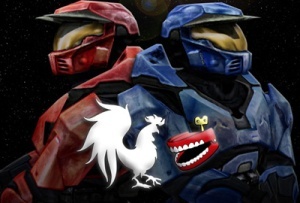 This competition has been developed and organized by the Rooster Teeth production team, who is most famous for the Red Vs. Blue machinima series. Animated using the Halo engine, Red Vs. Blue followed the exploits of two teams of soldiers while they lampooned popular first-person shooter conventions. Rooster Teeth founder Bernie Burns will judge the contest entries with input from a panel of game and film industry professionals. Fantastic Arcade will run from September 23-26 of this year. The semi-finalists of the machinima contest will be publicly announced on September 20th, while the winning entries will be recognized and aired on theater screens at the Fantastic Arcade Awards Show on September 26th. Interested teams can find full contest details and register at the official website.